Tell us about your current ride and set up. 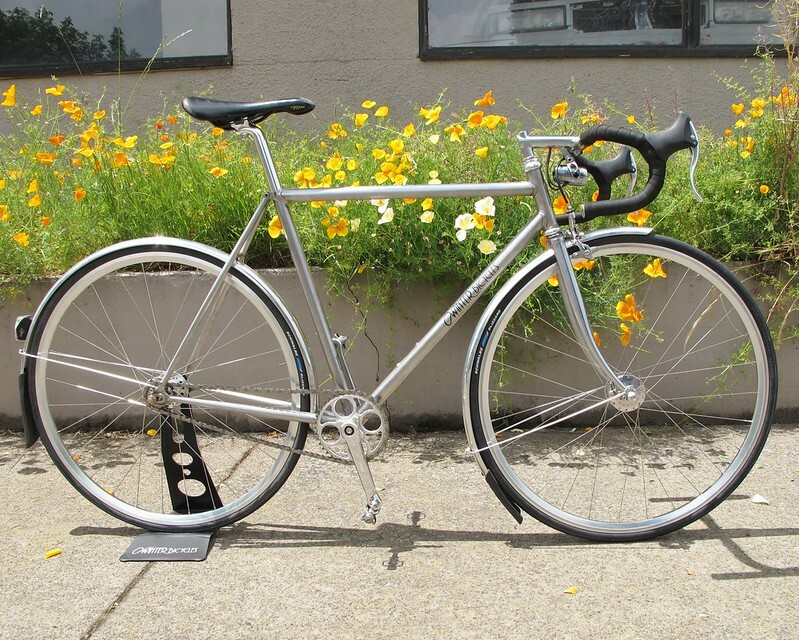 I have a couple of bikes around between demos, etc, but my two main squeezes at the moment are the stainless "Fixed Urban" (or my "FU" to be crass) and my "Thin Iggy" road bike. The Fixed Urban was built as a test sled for the then new KVA pipes. It is made from their initial run of double butted tubes and has the second set of tapered seat stays to come out of heat treat. I originally set it up and rode it with a cruiser bar, but recently made a new stem for it and put on some Nitto drops. It is essentially a stage race bike tweaked for fenders and fixed provisions. Micro bikini whale-tail lugs (named for their shape, obviously), internal light wiring and an integrated E3 mount. I love it. Not to long ago I built up a new road frame (the Thin Iggy)to work through a couple of ideas I had, both in material selection and finish. This bike is built using classic diameter tubes, but with a modern shape and fit. The blending of classic pipes, a semi compact fame and medium volume tires has been a lot of fun. It runs a 28, and can fit up to about a 32 (actual) under standard short reach brakes. It is fun to have a racey package with a tire that is a larger diameter then the top tube (or even the down tube, depending). Both of these are variations on that "high performance, non race bicycle" concept I discussed earlier. While the Iggy could certainly be raced, both were designed to give a high performance edge to every day riders. To suit my tastes, they are "race-type" bikes tweaked for my riding and for things like full coverage fenders to fit my needs. Last edited by EricEstlund; 09-30-2012 at 01:17 PM. Wow, those are both very sweet rides Eric! The FU looks like the Perfect Winter Willamette Valley training bike with fender extensions and all. This brings up a question: I see you have curved fork blades on the FU, and straight blades on the Iggy. Other than aesthetics, is there a reason to go one way or the other? Are you a straight blade or curved kind of guy? I like the swag! Is that available to the public at large? I vary the forks based on the bikes. Within typical road bike ranges, the differences between curved and straight raked forks are mostly academic. I can better tune the fork with the choice and cut of the blade. For certain outliers there may be functional drivers, but generally it is an aesthetic choice. The two bikes have very similar contact points. The forks above are virtually identical in length and rake. They ride pretty much the same. As far as the jerseys go- YES they are available. I order these in small batches based on demand. 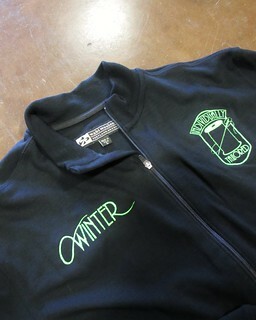 They are made by Harth at Wabi Woolens in Portland, and embroidered locally. They are the Sport Series, and are pure luxury. Same price as Harth- $175. If any one is interested in getting on the next batch, shoot me an email. Last edited by EricEstlund; 10-01-2012 at 09:17 PM. 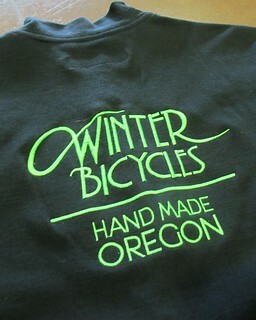 I'm not sure the best way to consolidate info, so I thought I would just add this link to Winter Bicycles: Showcase Threads. Guess it figures since blues is your default, you'd be into the Allman Bros (i.e., Duane). Oh, wait- you said Allann Bros. Sorry abt that! But anyway, thanks for the stem you made for my Kirk. eric said, "Not to long ago I built up a new road frame (the Thin Iggy)to work through a couple of ideas I had, both in material selection and finish. " 1. When you were trying things out, what ride qualities made the final product "it" or right to you? I mean, your vision of how this bike should ride is most certainly different from how another framebuilder's vision would be. So what made the final product "right" to you? 2. Given #1, is there a consistency between your bikes? Like they should all have that jump when putting the pedal down or whatever it might be..
3. I realize that each customer is different and has slight differences in their requests. How does a frame builder know how their final product's ride matches their customer's ride wishes without actually riding it himself? Love that FU bike, btw. Last edited by roguedog; 11-06-2012 at 07:10 PM. Thanks! There is a lot here- so I'll try to tick away at them. Feel free to ask if you want more. 1. Trying things out on the metal work, bike design (functional) or visual end? - Metal work: No real surprises, this was a fairly "standard" fillet frame with a few details. - Design: I wanted something more forgiving then my normal bike (a very stiff fixed frame) with more room for bigger rubber. I also wanted to keep it feeling "like a race bike". At odds? Not so much- I choose tubes that allowed for a certain general ride compliance, a stiff (enough) pedal feel, and went with a pretty proven geometry (with some minor tweaks for the bigger rubber). -Paint: I had a vision in my head, and after a couple of experiments we worked out how to get 98% of the way there. 2% more and it's ready for prime time. 2. The consistency is in the quality of the frame and the pursuit of the clients needs. My goal is to build the right bike for the rider, not the right bike for me if I was in their situation. There are certain traits I default towards, but really take my ques from the clients needs and tastes (within reason). 3. Experience and communication. Before starting Winter I've fit and sold many bikes to many riders. Learning how to hear someones needs, and how to address those came before picking up the torch. Now that I build, I have more options and can address more finite minutia in behavior, spec and fit. I know how different tube combos interact. Part of the design process is learning a new mutual lexicon for each person. Once I have a feel and can effectively communicate their needs back to them I usually have an intuitive picture in my head. From there it's pulling it out and putting it together. Does that start to answer you questions? 1. I guess I'm just trying to get into the mind of an effbuilder and understand the process, though I suppose it varies by builder. Here I was just asking about the process of your vision and thru the creative process and what finally made the final product that "ahhh..that's what I was building". I was more curious I guess to the ride qualities that made it "just right" and what they were. In truth, I'm sorta fascinated with the whole creation process ..like how you decide what tubes, what diameters of tubes, what lightening or processing of tubes, etc to achieve what your mind envisioned ride your looking for. Heh..but I was trying to "dumb down" the question to simplify it. 3. So given #1, I get how someone would build something for themselves but trying to understand here how an fb truly understands how their final product will ride for say..someone 5 feet tall and 105lbs or even someone 6.5 ft tall and 200..with all the subtle asks that each such customer might request. How do verify this..but it sounds like a "you just know from experience"
Hey thanks for putting up with the "wonderings" of a new. Thanks- I'll take another swipe at it. It sounds like you are asking about how I juggle the variables in my head, and how that translates to a bike for a given rider. I always start with the rider. What are their uses? How are they shaped? What are they used to (past bikes)? What has and has not worked for them in the past? Many of the seemingly esoteric variables get worked out during the interview/ design phase. If someone wants a "stiffer" or "more compliant" bike, knowing what their fame of riding reference is helps. I work on defining these soft terms specifically to the user’s application- a unique lexicon to the particular build, as it were. I go through a fairly heavy interview process with most of my clients and tease out how I can build what it is they need. While some of the visual elements happen sculpturally- that is, during the making, the general heart of the bike is well decided on from those conversations. The ability to do this comes from experience; experience in the saddle, teaching cycling, and working with adaptive programs and in the shop working with riders of all sorts of body types, physical and functional needs. It's less a black art then it is a cumulative intuition based on years of experience and problem solving. To your point about "right" or "proper" ride quality and behavior-I don't buy into it. There are certain tried and true methods and geometries, and they absolutely have their place. What I am trying to do is tweak it one step further to fit the specific need, wants and anticipations of the rider. This will vary based not only on the type of bike, but on how they use it. I am not interested in building a bike to customer provided geometry numbers, but I am interested in building to their needs. Last edited by EricEstlund; 11-10-2012 at 06:06 PM. Hey Eric. Just wanted to say thanks again for the long answers. After a couple re-reads I think I'm starting to get your point.